Those seeking the rebel's grave must hasten for successive accounts appear to indicate it is gradually disappearing. A 19th century chronicler, merely recording its existence, estimated the height of the obelisk at six feet. A subsequent article appearing in 1935 states that the historic stone stands 2 feet square but reduces its height to some five feet. Thirty-three years later, a small reference booklet, again simply noting the stone, sizes it still smaller at 4 feet 6 inches. The story, allegedly passed down by descendents of those present at the interment, holds that a group of Jacobite prisoners were being transported for trial between Edinburgh and the Tower of London. After passing through Tuxford one attempted to escape, falling from the cart and breaking his neck. A local man was paid a shilling to dig a grave and the Tuxford town drum was procured to enable a rudimentary military funeral to take place. The unfortunate rebel was duly interred in an upright position at the point of his demise. The puzzle remains as to who he was. The evidence suggests that he was of some importance, for the obelisk, which surmounts his grave, is of a red stone not found locally. The trouble taken to transport such a monument, combined with the effort afforded to ensure the corpse a decent burial shows that whoever he was, he was no ordinary felon. 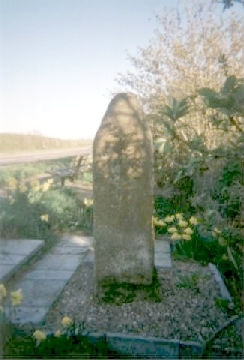 His obelisk, once protected by iron railings but now open, is easily located on the western side of the old A1 (now the B1164). It stands in a prominent position on the grassy verge 2km south of the village just beyond the overhead railway bridge. When visited in April 2002 the immediate area appeared to have been subjected to recent improvement. It is approached by some new stone steps and surrounded by well tended flowers. The inscription however, is now barely legible. A local legend states that Scots drovers at one time used to remove chippings off the stone, not for souvenirs but for protection against toothache!